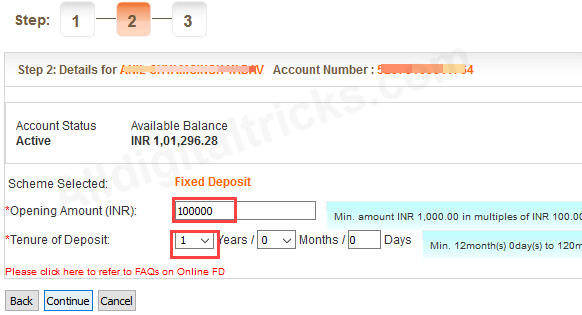 How to open Fixed Deposit online in Bank of Baroda through net banking. Bank of Baroda offers various deposit plans that you can choose from depending on the term period, nature of deposit and its unique saving and withdrawal features. BOB Fixed deposits are categorized into deposits with a term period of less than 12 months, more than 12 months and you can choose any term suitable for you. Today we will show you how to open fixed deposit online through net banking. Bank of Baroda provide Net banking and mobile banking facility, you can open fixed deposit using both facility. See how you can apply for fixed deposit online using internet banking. 2: After login, click on Invest tab and here you can see Online FD option, click on it. There are other fixed deposit options available too, you can select any option. 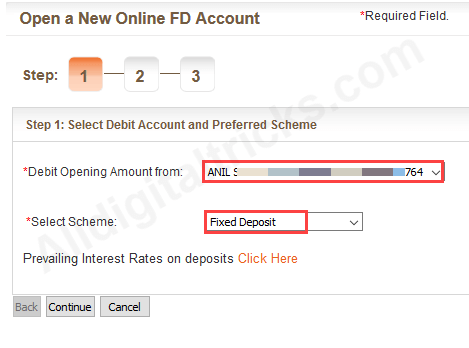 3: Next screen select your account number and choose Fixed Deposit in Scheme & click on continue. 4: Next page, enter amount which you want to invest on fixed deposit. You can enter minimum 1000 and no limit for maximum. Select tenure for deposit, In fixed deposit minimum tenure is 12 month and maximum 120 month. Now click on continue. 5: On next screen check and confirm details. You can see here maturity amount. 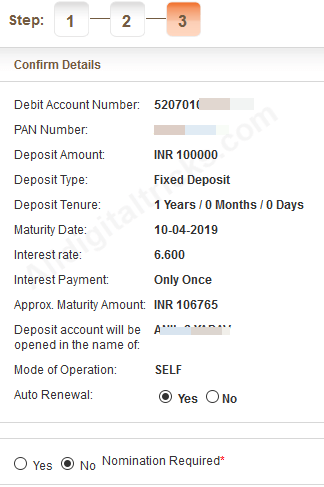 If you want Auto renew fixed deposit then select Yes otherwise select No. You can also add nominee (optional). Now enter your User ID and transaction password and click continue. 6: Done! your fixed deposit opened. You can see acknowledgement page. Click on on save to download your deposit receipt. You can see your deposit account details after 24 hours through net banking and mobile banking. 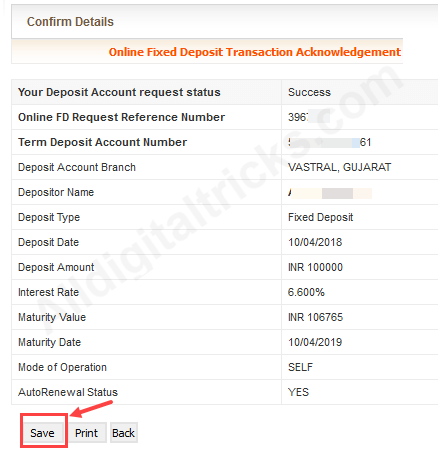 So this is how Bank of Baroda customers can now open fixed deposit online without visiting branch or filling form.